We enjoy a balance of spiritual growth, sharing, support, and service to the church, community, and each other. 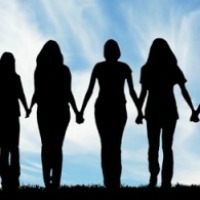 The Women’s Circle is a caring group of women of all ages and walks of life, who find comfort in the spiritual fellowship, as well as the avenue to contribute to the church and the well being of each other. Come join us for fellowship and fun in the spirit of service. Note: The Women’s Circle has an ongoing collection of personal size toiletry items. If you travel and have accumulated small, unopened packages of travel toiletries (shampoo, soap, lotion, etc.) please consider donating your items. There is a collection basket in Fellowship Hall. The Women’s Circle gifts these items to the Atlanta Day Shelter for Women and Children on a regular basis.